Financial advisers continue to profess that US treasuries should be a large part of a balanced portfolio. With the 10-year treasury yielding around 1.6%, the advice is hardly based on return expectations. It is also not due to expectations of mark to market gains. The up-side case in being long the 10-year treasury would be if the rate were to drop to the level of Japan's - just over half (a fairly unlikely outcome). The mark to market gain would be 7.5%. The downside case on the other hand would be if the 10-year yield rose to what it was just a year ago (or higher) - say around 3%. The mark to market loss would be around 11.5%. So the instrument effectively has an asymmetric payout profile and terrible current yield. What gives? What many advisers point out is that long-term treasuries can significantly reduce portfolio volatility - acting as a hedge. And investors are willing to live with the poor returns and asymmetric payout profile (paying insurance premium) in return for stabilizing their portfolios. The horizontal axis is the percentage of the portfolio invested in SP500, while the vertical axis is the daily volatility over the past two years. 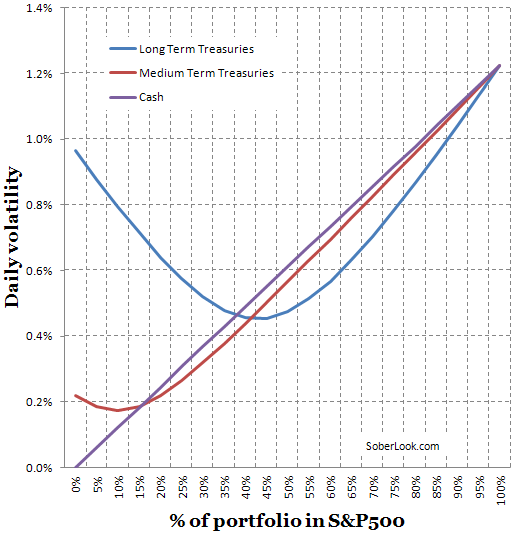 100% of the portfolio invested in SP500 produces a volatility of 1.22%. As we start adding other assets the volatility declines. What this tells us is that long-term treasuries have provided the largest reduction in portfolio volatility while allowing the investor to maintain a fairly high exposure to equities. With 45% in equities and 55% in long-term treasuries (optimal portfolio mix), the volatility drops to 0.45%. The same mix with medium term treasuries produces volatility of 0.50%, and cash at this same ratio results in 0.55%. This explains why market participants are willing to hold treasuries in spite of an asymmetric longer term payout and extremely low current income. Long-term treasuries provide effective short-term insulation (better than cash) against volatility - a property that has been extremely valuable to investors. It is unclear however whether treasuries will continue having the same volatility-reducing properties over the long-term. We've certainly had periods in the past when this relationship did not hold (1994-96 for example).